When beginning to learn PEAK, the best order in which to explore the modules is: binding, config, and naming. 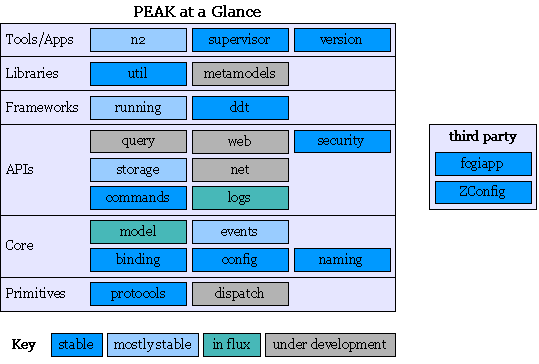 These core modules provide the component-oriented framework upon which most other PEAK modules are built, and they will be used extensively within any application built with PEAK. The next layer to explore should probably be the runtime modules: ?running, commands, and logs. Combined with the previous core modules, the runtime modules provide most of the machinery needed for building PEAK applications. The storage module provides numerous storage management features, including high level relational database connectivity, a general transaction framework with ACID assurance and two-phase commit, and a ?DataManager framework for high level object persistence to multiple storage media. The model module provides a framework for implementing the ?DomainModel pattern, which is based on high level "business objects" isolated from storage concerns. The events module provides an "event-driven" programming framework that supports ultralight "microthreads" implemented via generators. It can stand alone or can be used atop Twisted for a more intuitive approach to asynchronous programming. Further modules to explore include the ?util, ?metamodels, and ?security modules. The ?web, ?net, and ?query modules are under development.